Every day, along with 40 other daily givers, I have the privilege of making seed grants to up and coming social change leaders around the world. Our team at The Pollination Project is happy to share the extraordinary people and projects that our community of daily givers is honored to support this week. Education for the Deaf in Uganda. Stephanie Feller and Rose Kyabukoolil, launched Equal Access to Education for the Deaf, to help under-serviced, deaf pupils at M.M. Wanyange Primary School in Jinja, Uganda. These students are being taught rudimentary sign language in a self-contained classroom and are then placed into the regular education classrooms without further assistance. Stephanie and Rose are creating a sign language club for both hearing and deaf students to learn sign language and support each other. "The sign language club will help to create bonds between the deaf pupils and their peers, and will enable the peers to serve as interpreters in the classroom," said Stephanie. Women's Cooperative in Belize. In the Sarteneja Village in Corozal District, Belize, 80% of the village's income comes from the fishing industry. As a result, the reefs have been over-fished, and this source of income has declined. Traditionally men provide for the households, but with the recent turn of events, women have had to step in to support their families. 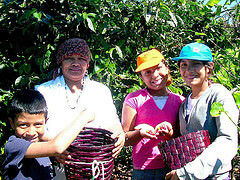 Las Sartenejeñas Cooperative is a women-owned, operated and led cooperative that provides a community resource to help develop new and sustainable means of income for this village. Peace Corps Volunteer,Jennifer Krottinger, has helped this group grow into an effective women's group, bringing women together to engage and actively participate in learning traditional sewing and handicrafts techniques for preservation of tradition, and to create positive and sustainable economic development for women. Helping Grassroots Organizations in Costa Rica. Joseph Foster is an emerging filmmaker with a passion for sharing the hidden stories of community collaboration and environmental protection in Costa Rica. With his project, Empower Costa Rica, Joseph is creating a series of short films supporting five nonprofit conservation and community empowerment organizations in Costa Rica. These films will be used as part of a promotional and fundraising campaign that help bring resources to combat the threats to Costa Rica's rainforests and other natural ecosystems. Transportation Assistance in Arkansas. With over 50 years of experience working with low income populations, retired R.N. Susan Presley launched Wheels for Workers as a way to support the transportation needs of lower incompe people in her community. Susan explains, "When your vehicle breaks down, and you live 30 miles from your work, you miss days and get fired." In a county where no public transportation exists, transportation need is second only to food need in the poverty-ridden community. In collaboration with the HELP DESK at the Open Arms Food Pantry in Huntsville, Arkansas, Wheels for Workers will provide transportation assistance to employed people. The goal is to give micro loans for vehicle repair or gasoline to allow people to keep their jobs if transportation fails. The Origins of Coffee in Costa Rica After living in Costa Rica for fifteen years, filmmaker Susan Lutz was inspired to direct and film, The Coffee Dance, a which explores the interplay of migrant farming, poverty, and the arts. The focus of The Coffee Dance is to bring consciousness to the choices people make every day that ultimately have an effect on the quality of life for others, by showing the connection between production and consumption. GSchool Lunches in Uganda. For over a year, Diana Velez, a Peace Corps Volunteer, has been living in Pallisa, Uganda and working as a teacher at a rural secondary school. Diana discovered that half of the student population needed more nutritious lunches, and she collaborated with the school's Agriculture teachers to meet the food demands of the student body by creating a student-maintained garden. Some students are fortunate enough to have breakfast at home; some are not as lucky. Similarly, students who are not able to afford to pay for lunch at school usually doze off in class or are too weak to participate in athletic activities. Gardening for School Lunch was created to address these concerns by creating a school garden managed by the students to provide them with lunch, to improve their academic environment, and to give them the opportunity to learn and apply agricultural skills. Equal Access for Girls in Uganda. In Uganda, young girls miss up to 20% of school per year because they can't afford sanitary napkins. This consistent absenteeism causes female students to fall behind in lessons, which can have a major impact on academic performance and achievement, confidence, and their decision to pursue further education. Peace Corps Volunteer Megan Carroll, is launching a project that provides materials to teach all the female secondary students in the rural village of Kashenshero, Mitoma District, in Southwestern Uganda, to create reusable menstrual pads (RUMPS). "By teaching these students this skill, all the female secondary school students in my village will have access to reusable pads, as well as the capacity of how to make more for sustainability. The project will also reduce school absences and lead to healthier, more confident women in Ugandan society," explains Megan. If you are inspired by these global changemakers and want to get involved in supporting their grassroots efforts, please join us as a daily giver! Learn more.